A limited edition autographed photo of H.E. Tsem Rinpoche as a teenager in Los Angeles, signed in permanent marker in the lower right corner. Ideal for anyone who is looking for a unique addition to their altar or shrine. An image of one's lama or spiritual guide is possibly the most important element on one's altar or shrine. It creates the causes for a close connection with one's teacher, thus spurring on one's spiritual growth. This limited edition autographed photo of H.E. 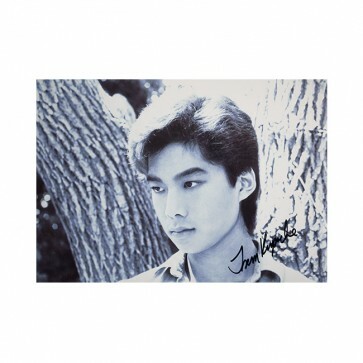 Tsem Rinpoche as a teenager in Los Angeles is signed in permanent marker in the lower right corner, and is ideal for anyone who is looking for a unique addition to their altar or shrine. Like any image of Rinpoche, it is imbued with his holy energies of wisdom and compassion, granting blessings and protection at all times.